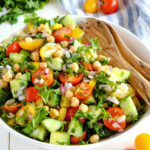 This Easy Mediterranean Chickpea Salad is the perfect make-ahead lunch for busy work or school days, and it makes a great healthy side dish or main dish! In a large bowl, combine the chickpeas, tomatoes, bell pepper, cucumber, kale, red onion and parsley. Pour the olive oil and lemon juice over the salad ingredients and add the salt and pepper. Toss everything together well and serve, or store in airtight containers in the fridge for up to 3 days (for meal-prep).